Participate in at least three additional (for a total of seven) Tier II or Tier III adventures at the crew, district, council, area, regional, or national level. 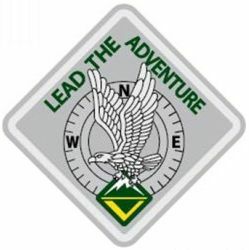 To earn the Summit Award, a Venturer must have participated in at least one Tier III adventure and served as a leader during one adventure. Since earning the Pathfinder Award, serve actively as your crew president, vice president, secretary, treasurer, guide, historian, den chief, or quartermaster for a period of at least six months. * At the beginning of your term, work with your crew president (or Advisor, if you are the president) to set performance goals for the position. Any number of different positions may be held as long as the total length of service equals at least six months. Holding simultaneous positions does not shorten the required number of months. Positions need not flow from one to the other; there may be gaps in time. Once during your term of office, discuss your successes and challenges with your crew president (or Advisor, if you are the president). Participate in or serve on staff for leadership training such as National Youth Leadership Training, Kodiak Challenge, National Advanced Youth Leadership Experience, Order of the Arrow National Leadership Seminar, Sea Scout SEAL Training, or Wood Badge (for Venturers 18 or older). You may also participate in non-BSA leadership training courses such as those delivered by the National Outdoor Leadership School, if approved by your Advisor. This must be a different training course than you completed for Pathfinder Award requirement 4(b) or Summit Award requirement 4(c). Since earning the Pathfinder Award, plan, develop, and conduct a service project as described in the Venturing Summit Award Service Project Workbook (512-938). Before you start, have the project proposal form from the workbook completed and approved by those benefitting from the effort, your Advisor, and designated crew or ship youth leadership. This project must be a different service project than one carried out for the Eagle Scout award, the Sea Scout Quartermaster Award, or the Girl Scout Gold Award. *Venturers may substitute district, council, area, regional, or national Venturing officer or cabinet positions for the positions listed in this requirement. **Venturers may, but are not required to share the personal reflection associated with Development of Faith with their Advisor during the Advisor conference, or during a board of review. ***For guidelines on the composition of the Summit Board of Review, Click here. A Venturer may apply previous Venturing experiences to receive credit for requirements 1, 4, and 7. The "Since earning the Pathfinder Award" portion of requirement 4a will be waived for Venturers who completed these requirements prior to June 1, 2014.